The city of Milwaukee had a population of just over 62,200 when the 1860 U.S. Federal Census was enumerated. Of this number, Irish-born residents account for about 8.6% of the population at circa 5,375. The county of birth was recorded for 562 of those people from Ireland. The numbers for each county are contained in the table below. Clare, Galway, Kilkenny and Meath were the counties that had the highest number of such instances recorded. 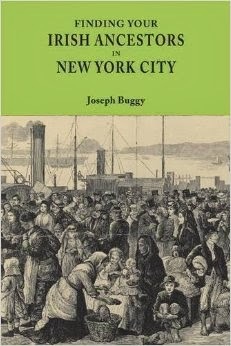 All instances of the Irish county of origin were for immigrants who lived in the 4th ward of the city. The census enumerator, or Assistant Marshall to use the correct terminology, for this part of Milwaukee was Maven Power. Maven was a lawyer who lived in the Town of Lake, Milwaukee County. His entry in the 1860 U.S. Federal Census noted that he was born in the state of New York about 1819. Also residing with him at the time was 31 year old Adelaide Powers, presumably his wife, and 18 year old Mary Kelly, a house servant, also born in the state of New York. It is very likely that Maven's Power ancestors were from Ireland and this could be a reason why he noted the counties of birth for some of those that he enumerated. The page below (click to view larger version) from the census enumeration shows the variation of places of birth for people who lived closely together in just seven houses - Galway, Mayo, Waterford, Carlow, Kings (Offaly) and Kilkenny are all represented. The 4th ward likely attracted Irish immigrants due to its proximity to jobs on the Milwaukee River and the railroad. A map of the city from 1856 shows the location of the 4th ward on the west bank of the river with the Milwaukee and Mississippi Railroad running through the southern section of the ward (click to view larger version). The legacy of this Irish area of Milwaukee can be seen in a later map from 1874 as there is a street in the 4th ward called Hibernia. I'd like to thank commenter cmkinhunter for directing me towards this example back in May. See the Census Series section for other instances of Irish place of origin recorded in the U.S. Federal Census. 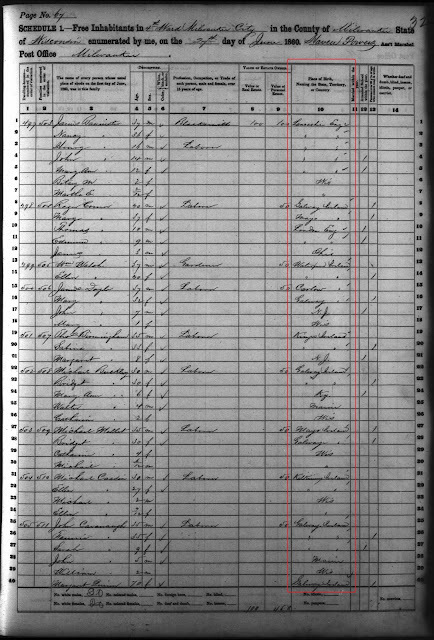 Fold3.com, 1860 U.S. Federal Census, Milwaukee County, Lake, population schedule, Town of Lake, Page 78, House 597, family 597, Maven Power and family; digital image, Fold3.com http://www.fold3.com: accessed 26 September 2015; citing NARA microfilm publication M653, roll 21250. All totals are approximates based on a manual search of county names. It is possible that some towns were listed instead of county names. The index gives 10 returns for Longford but two of these are for 'Long Ireland' and upon inspecting the census documents they were for people from Long Island (New York State). 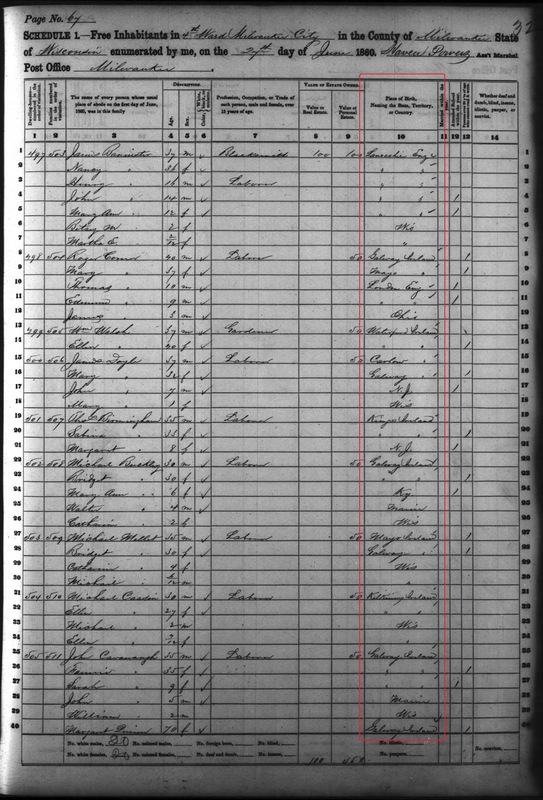 Fold3.com, 1860 U.S. Federal Census, Milwaukee County, Milwaukee, population schedule, City of Milwaukee, Page 67, House 497-505, families 503-511; digital image, Fold3.com http://www.fold3.com: accessed 26 September 2015; citing NARA microfilm publication M653, roll 21253. The latest edition of Irish Lives Remembered genealogy magazine is out and in this edition I wrote about researching your Irish ancestors in Texas. Access here.